Hello Friends! 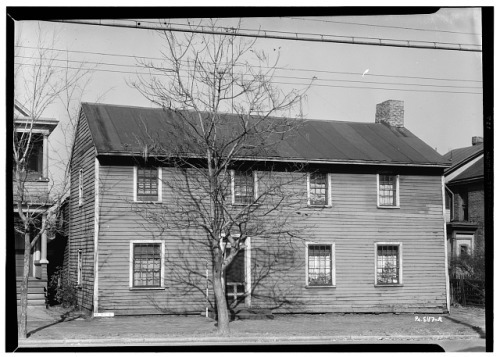 Today’s post is about the earliest American common houses, those built before the age of the Second Industrial Revolution, which completely changed the landscape of not only architecture but commerce, society, and culture. Transcontinental and local rail, perhaps the most dramatic transformation of the Second Industrial Revolution brought all kinds of goods, including homes, to people all over the country, transforming the way Americans worked and lived. Before rail travel, most everyday houses were exceedingly small, relegated to local materials found near the site of the home and often self-built by those who lived in them, sometimes with the help of local craftsmen. 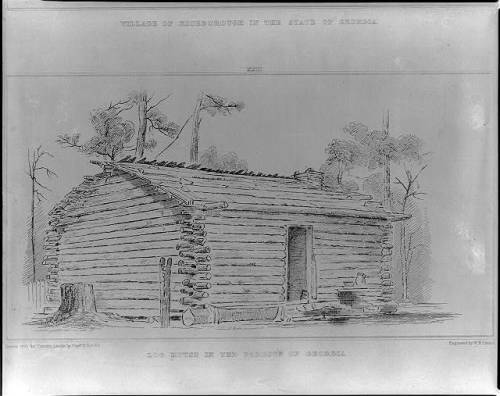 Log House in the Forest of Georgia, 1829. Via Library of Congress. 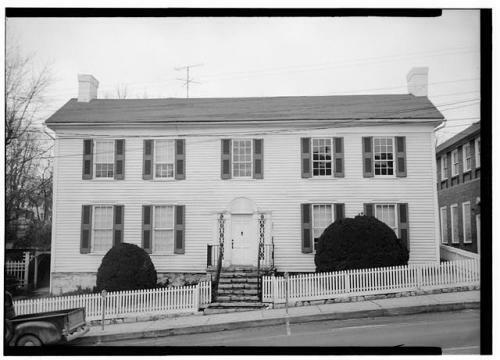 The appearance of these early houses were more determined by geography than aesthetics. They were built to suit the needs of people who lived in certain climates, with easy access to location-specific materials. 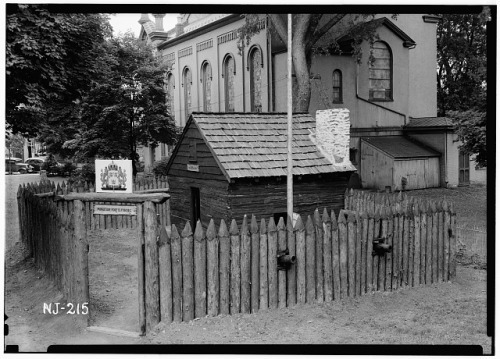 For example, the saltbox houses of New England featured deeper plans in order to have more protection and room for living during the prohibitively harsh winters. Their characteristic steep sloping roofs helped mitigate potential collapse from the rooftop accumulation of heavy snow. Before railways, most commodities, including building materials, were shipped along waterways, hence why so many cities were built along their banks. 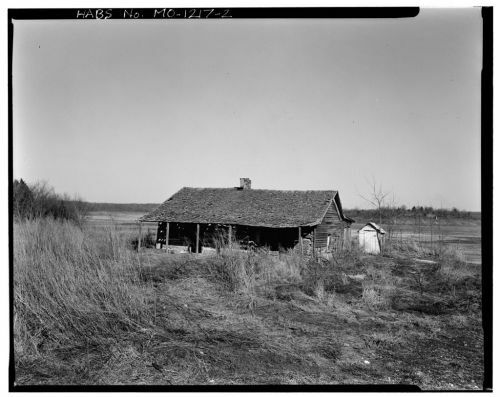 Outside of cities and farms connected by water, the cost and labor of transporting goods by horse and carriage was prohibitive to most, leaving those in rural areas little choice but to build homes using only the materials around them (McAlester, 119). Along the East Coast and into the Midwest, vast forests provided plenty of timber for local construction. 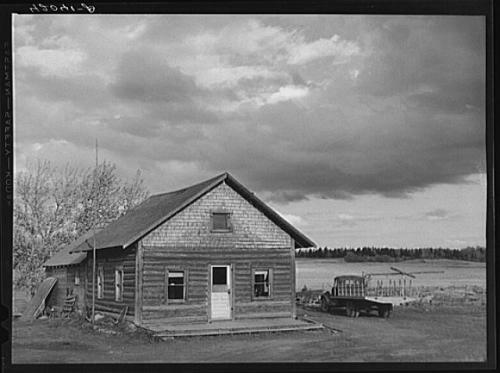 Many modes of timber construction were brought over to the New World from European building techniques. In New England, the British established building traditions of massive open timber frames covered with shingles or boards. 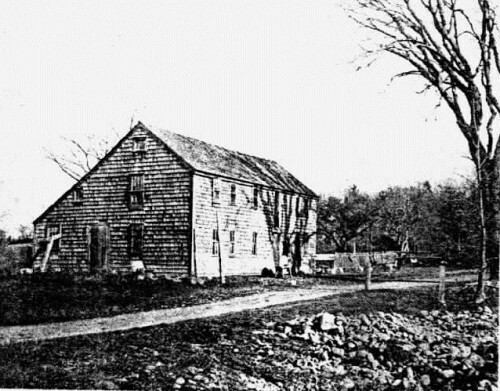 Edmund Rice House (1643), Wyland Massachusetts. Public Domain. Tidewater house in Missouri. Via Library of Congress. Midland (Mid-Atlantic) traditions combined several traditions brought over from German immigrants. 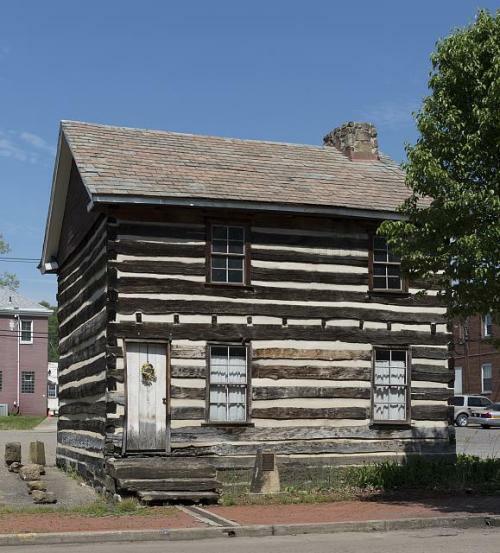 These traditions follow the techniques of what we traditionally consider “log houses” in that beams of wood were sawed into interlocking pieces and stacked vertically to build a solid wall, sometimes cemented together with clay masonry (McAlester, 127). 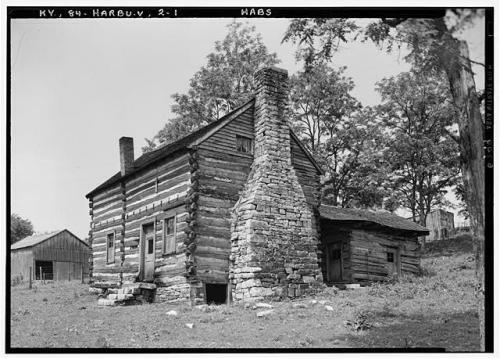 These traditions spread south along the Appalachians, and because of its efficient use of materials soon became the dominant technique in vernacular house construction. Marrs House, Mercer County, Kentucky. Via Library of Congress. In the Midwest, where timber was scarce, early settlers borrowed frequently from the masonry traditions of Native Americans. 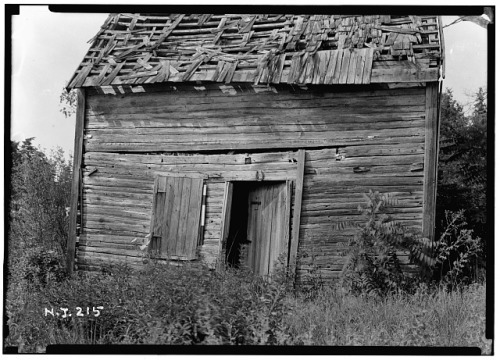 In the heart of the Great Plains, houses were frequently constructed from bricks fashioned from the thick sod that covered most of the land - an approach that was continued well into the late 19th Century, though as wood became more available it replaced sod as the primary material for roof construction. 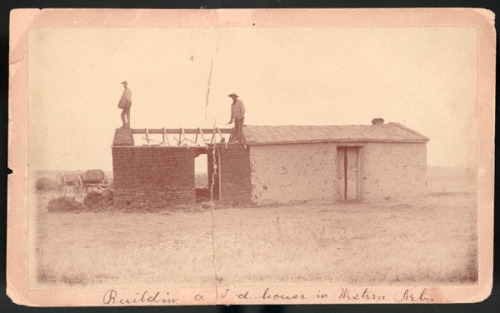 Building a Sod House in Western Nebraska, 1890s. Via Library of Congress. What is interesting to note is that while these early houses seem crude by today’s standards, the basic composition of their floor plans continued well past the Industrial Revolution. This is especially the case with the homes of the Tidewater South, whose floor plans persisted into the modern era. One-Room Side-Entry house, English frame construction. New Jersey. Public Domain. 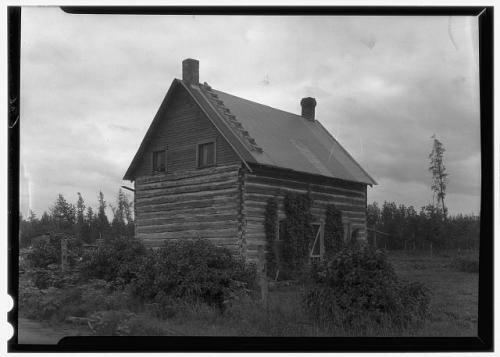 One-Room Short-End Entry house, Midland log construction. New Jersey, Public Domain. 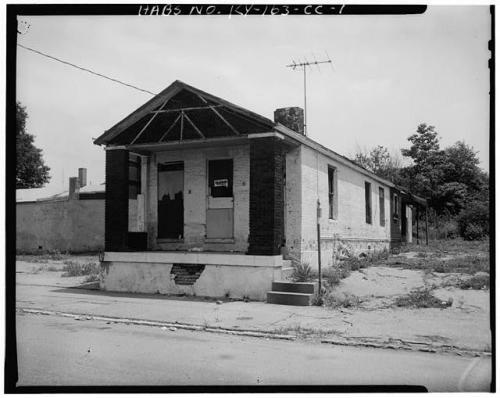 These houses were often either temporary, or were modified, extended, or otherwise incorporated into larger structures as needed. 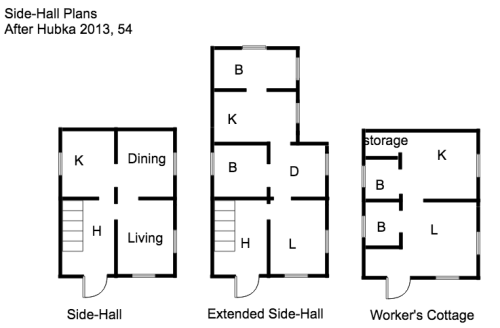 This type of floor plan dwindled away after the Second Industrial Revolution, when technological advances made it easier and cheaper to build larger, yet still modest homes. Often called “Hall and Parlor” (if one or one-and-a-half stories) or “I-houses” (if two stories) these plans were found in all parts of early America. The idea of a central hall was brought to America via English building traditions, and evolved throughout the 19th century. 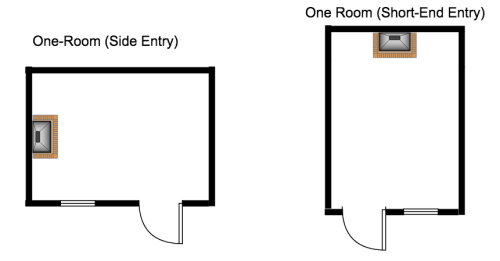 The main divisions amongst houses built around a central hall consists of the number of stories and the positioning of the entryway, which opens either into the central entrance hall or directly into either the hall or the parlor. Overall these houses mostly consisted of 2-3 rooms, with 2-story variants consisting of 2-6 rooms. 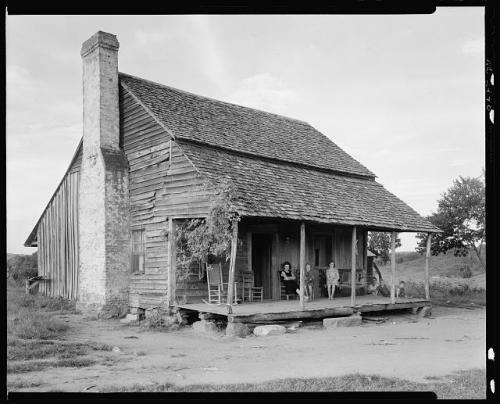 1.5 Storey Hall-and-Parlor Center Passage house in Missouri. Extended Hall-and-Parlor house in North Carolina. Two-Room-Deep Central Passage Type, 1700s. Tennessee. Via LOC. Two-Room-Deep Germanic Plan House, Erie, Pennsylvania. Via LOC. Our final plans for today are the Side-Hall type plans, which are derived from two-story attached rowhouses. These began to become common in the early 1800s. They were usually 2-3 rooms deep and 1 or 1.5 stories tall. The total number of rooms ranged from 4 to 8. Plans based on this layout were popular and continued well into the 20th century, often morphing into their own typologies. Typical Side Hall. 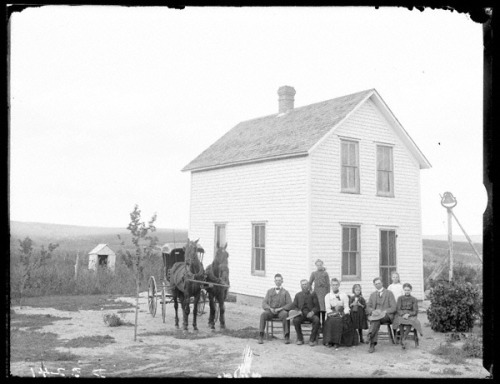 Nebraska, 1800s. Extended Side-Hall, ME. Date unknown. Worker’s cottage (AKA Shotgun House), built c. 1870s. The Worker’s cottage represents a transition into the industrial age, a period that will be studied in-depth in next week’s’ installment of Looking Around! I wish you all a lovely start to your week, and be sure to stay tuned for Thursday’s Missouri McMansion! If you like this post, and want to see more like it, consider supporting me on Patreon! Also JUST A HEADS UP - I’ve started posting a GOOD HOUSE built since 1980 from the area where I picked this week’s McMansion as bonus content on Patreon! Not into small donations and sick bonus content? Check out the McMansion Hell Store- 100% goes to charity. Carter, Thomas, and Elizabeth C. Cromley. Invitation to vernacular architecture: a guide to the study of ordinary buildings and landscapes. Knoxville: University of Tennessee Press, 2008. Gottfried, Herbert, and Jan Jennings. 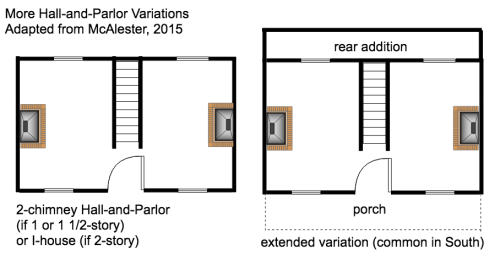 American vernacular buildings and interiors 1870-1960. New York: W.W. Norton & Co., 2009. Hubka, Thomas C. Houses without names: architectural nomenclature and the classification of Americas common houses. Knoxville: University of Tennessee Press, 2013. McAlester, Virginia, and A. Lee McAlester. A field guide to American houses: the definitive guide to identifying and understanding Americas domestic architecture. New York: Alfred A. Knopf, 2015. Atomicpunk: Optimistic retro science fiction based on the Space Age. Think The Jetsons. Biopunk: This genre is about altering genetics and DNA. These stories often take place in the near-future in which humans have been altered or in which human experimentation is common. Candlepunk: Similar to clockpunk, but darker and with less technology. Clockpunk: Think Da Vinci’s inventions, but more advanced while. This genre follows the aesthetics and technology of Western civilization during the mid to late middle ages, though sometimes it’s set in the Victorian era. Cyberpunk: Has advanced technology and often focuses on artificial intelligence and the cyber world. The setting is often near-future rather than far-future. Blade Runner is an example. Dieselpunk: Based on aesthetics and technology between World War I and World War II, sometimes up until the Cold War. Decopunk: Ranges from the aesthetics of the 1920’s to the 1950’s. Decopunk aesthetic is heavily based on modernism. Less gritty than dieselpunk. Elfpunk: Basically urban fantasy, but with common high or epic fantasy creatures put in an urban setting rather than vampires and werewolves. Nanopunk: Similar to biopunk, but biotechnology is less available and nanotechnology is common. Sandalpunk: Set in ancient worlds, such as Rome, but with advanced technology. Splatterpunk: Extremely graphic and contains a lot of gore. Steampunk: This genre gets its name from the heavy steam-powered technology involved. Aesthetics are based on the Victorian and industrial eras of the Western world, though other cultural elements may be used. Western Steampunk: Similar to steampunk, but with Western (as in Wild West) aesthetics and settings. So why are there so many sub genres? For starters, they help agents and publishers get an idea of what they’re in for if you’re going through the traditional publishing route. While bookstores usually just put these genres within science fiction or fantasy, you can still market your book through sub genres to reach a specific group of people who are looking for these genres. However, there are a lot of sub genres, most of which many have not heard of. If you’ve written one of these genres and intend to publish it, the best would be to put it under another name (with the exception of steampunk, cyberpunk, and biopunk). For example, if you have written a candlepunk story, you can propose it as fantasy, alternate historical fiction, or any other genre it may fit in. While atomicpunk is quite common, it’s not well known by that name. If you have written an atompunk story, the best way to market it would be to call it retro science fiction. But what’s the difference between punk genres and historical fiction? The technology is a big difference. It’s usually more advanced for the time it’s modeled after. The technology is one of the defining aspects of steampunk. It’s the basis for the world you’re writing in. For the typical steampunk story, technology will be (of course) steam powered. Another defining feature of steampunk is the aesthetics and the characters. Steampunk takes the latter part of the word (punk) to mean the opposition of the mainstream, though that’s not always necessary in your story. Research jobs common in the Victorian age and add steam to it. Your characters will revolve around their setting and their clothing may be a part of that too. I’m going to give a picture answer first because a picture is worth 1,000 words. Now, for the full explanation, grab a cup of tea and a blanket, shut the door and lock it, and get ready for the world’s first clear-cut answer on what the hell is going on with Solarpunk/Lunarpunk. The community needs some clarity right now, tbh. WHAT IS SOLARPUNK/LUNARPUNK? HOW DOES IT RELATE TO CYBERPUNK, STEAMPUNK, BIOPUNK, FLOWERPUNK, ETCPUNK? Solarpunk and Lunarpunk in a sense are very simple—but are (for now) representing three different things and that can cause some confusion. 1. AESTHETICS GROUP: To these people, these words are a neato visual style that is pleasing to look at, read, listen to or watch, etc. To them, that’s all it needs to be and anything else is extraneous. They’re here to enjoy a vivacious aesthetic in the same way you’d enjoy impressionism or cubism at a gallery. - Lunarpunk means cool-colored, darkness-referencing architecture, clothing, art & beyond which is shrouded or shadowy in style, typically referencing the darker elements of life as we know it now, especially where they relate to Earth’s Moon, its cycles, its influence, etc. Imagine a Wiccan woman, clad in bio-luminescent robes, singing a beautiful song in a minor key to herself as she wanders through the shallow waters of a moonlit pond at 3AM, looking for ingredients for an alchemical tincture to heal her injured pet wolf on a late autumn night. That would be pretty dang Lunarpunk. + Solarpunk means A speculative fiction style/genre defined by an optimistic near-future which sees renewable energy powering the global energy infrastructure aided by a vigilant nature/technology balance that always leans in favor of nature first—all existing under the notion that all people are equal and thus treated equal, and all who cannot perform as an equal are accommodated until they can. There is, somewhere, a need to cause a stir and an uprising because, although the place is quite utopian and sustainable, there is still a problem somewhere, and usually an oppressive one—to either a group of humans, the natural world, or something similar. This is where the -punk comes in, and because Solarpunk is painted as such a Utopia critics often complain that you can’t possibly make good stories out of an ideal world. Their flaw here is that they don’t realize that humans always have a problem no matter where they are or how good things might be because they are a self-destructive species that must always be kept in check to keep from destroying all that is good. Okay, we gotta go deeper before we get to Group 3. With Solarpunk, we are basically extracting all of the yang out of all of humanity and turning it into a character and calling it “Solarpunk the Almighty Utopian Person, Hooray!” In and of itself, this character is doomed for it would have no yin to balance it as the very laws of existence require. Solarpunk, unopposed would destroy itself. This is why you will often see so many people critiquing Solarpunk and that it won’t work as a genre because “you can’t have a story without problems” and so on. And maybe, indeed, there are authors out there who sat down to pen a Solarpunk story and thought “wow, they were right!” but the reality is that Solarpunk can exist by itself (without Lunarpunk there to round it out in the way it does in my story), it’s just that you’d have to handle the story in a way which is so potent in elements of yin within yang energy (the dark circle within the light blob) that no one could possibly doubt that’s what’s going on. 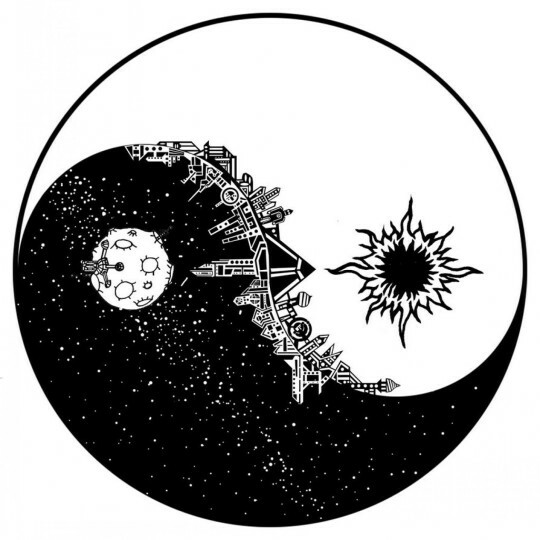 Not having a yin-yang balance is what people are worried will cause the idea of a Solarpunk Novel to fall flat on its face, and so I took the time to address how that’s avoided as a bonus section of this post for authors, skeptics or critics of Solarpunk to reference. - You might see an inventor without a place to call home trying to get back on their feet to continue developing a solar-powered industrial engine who needs your donation. - You might see a “ProtoSol” trans woman campaigning for political change in accordance with “Solunarpunk” ideals. - You might see a differently-abled wheelchair user drafting architectural blueprints and renderings for accessibility parameters for our future “Solunarpunk” cities so that no area is any less accessible to any type of differential ability. - You might see a board of neurodivergent people volunteering their time to assist legislators in changing judicial policy on how to handle neurodivergent or non-normative behavior in relation to the justice and penal systems. - You might see a little person (with dwarfism, that is) contributing to a think-tank where city planners of a “solunarpunk” future would ensure all height variations are accounted for in city planning elements such as public transporation, etc. All in all, the practicality group is working to put Solarpunk and Lunarpunk into the real world ASAP, usually because they feel it’s one of our last chances at turning this planet around before it’s doomed. On this level of thought, the only difference between Sol and Lune is the Aesthetics and Genres mentioned up above. 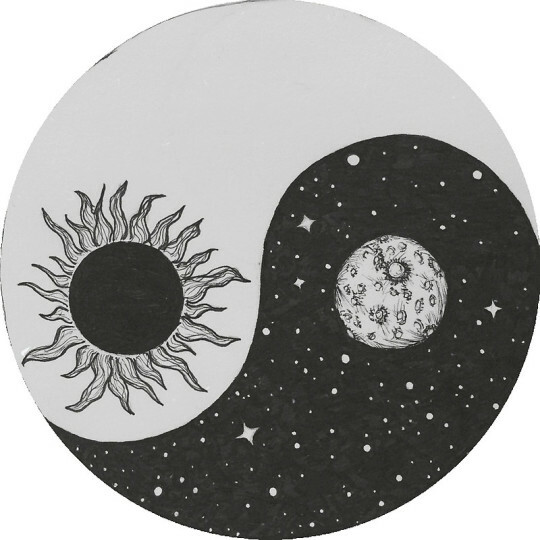 This is because, in reality, every Solarpunk action has an equal and opposite Lunarpunk reaction, and both sides of this aesthetic are equal and committed to holding the world up while it heals, like two crutches to a person trying to walk again after an injury. They’re just very differently colored “crutches” made of different materials, but they’re the same height, and the same strength, and they love working together to help their human. I hope this exhaustive, comprehensive guide answered your question and just as importantly, anyone else’s who might stumble across this. There’s not much tangible Solarpunk anything in the world yet despite a few years of think-tanking (so little, in fact, that our Wikipedia page was revoked), so things like this with perceptively-defined characteristics can be really useful to a loose affiliation of brains trying to pool together to organize a coherent meta-brain that can hold itself together and accomplish its goals. Any edits, questions, comments or concerns about this post can message me any time. Please reblog to share this information with whoever could benefit—I took a couple hours to make sure I did this the right way! Thanks and follow The Carbon Coast blog for updates on my novel, follow Photosynth-SolarpunkMusic for my Solarpunk Music project, and I’ll be here any time for talk and questions. p.s. An important “See Also” is “Ecofiction”. Ecofiction is Solarpunk’s older sibling, that just spends their days trying to please everyone, being a pushover with no real goal or ambition, yet still gets all the attention from the family because they’re always just there when people need them. Solarpunk loves Ecofiction, but on a day-to-day basis, it’s hard to get along, because Solarpunk doesn’t settle for something that’s just “set in a natural setting” or “details the outcome of global warming apocalypse” or some other loosely nature-affiliated speculative fiction. Solarpunk knows exactly what it wants from life, and just because it hasn’t gotten there yet, and is still living at home with its parents, it’s only so much longer before it finally gets recognized for all the positive ambition it has had for a few years now! What Will Real Aliens Look Like?